NEWLY CONSTRUCTED AND BEAUTIFULLY PRESENTED SPACIOUS FAMILY HOME READY FOR IMMEDIATE OCCUPATION. 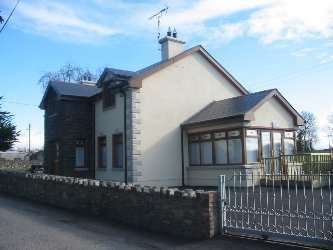 THIS PROPERTY IS BEING OFFERED FOR SALE WITH ALL FURNITURE AND APPLIANCES INCLUDED IN SALE. Built in wardrobes in bedrooms and each has Plaza T.V. Which are included in the sale. Fully tiled bathroom with jacuzzi bath. Tarmac driveway with electric gates. 10 mins drive from Dundalk.